Today is my niece, Cheyann's 5th Birthday! Happy Birthday girlie! 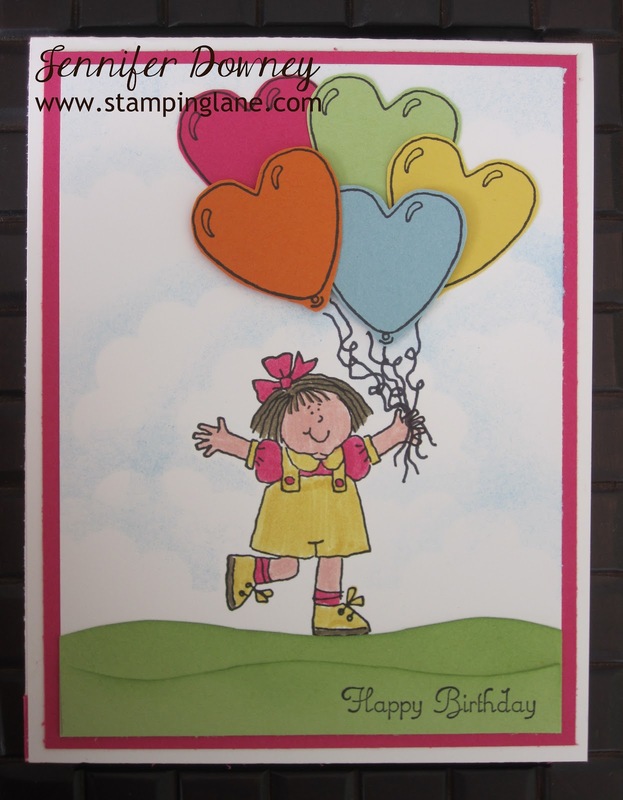 This is the card I created and mailed to her. I recently accumulated this oldie, but goodie, stamp set "Kids At Play" from my sister who no longer needed it. So, I thought what better time to pull it out and give a whirl! I thought it would be appropriate for this sweet little girl to be holding 5 balloons. The grass is actually sponged with Wild Wasabi ink to give it a little depth. And it's hard to tell, but I sponged clouds in the sky using a Scallop Circle Punch, a sponge and Bashful Blue ink. I thought the card turned out rather cute for my first attempt with this set. Hope she has a fantastic day! Happy Stamping!